The poor old celeriac - it's too often overlooked because it's gnarled, nobbly appearance scares most of us hurrying down the vegetable aisle. But when cooked right, celeriac is actually incredibly tasty, with a celery-like flavour and delicious, slightly nutty undertones. Plus it packs some impressive health benefits, including significant amounts of potassium which helps to regulate blood pressure, plus vitamin K and phosphorus, both important for bone health, and all with only about a third of the calories of potatoes (by the way, celeriac can also be mashed as a much lower calorie and more interestingly flavoured substitute for mashed potatoes). Cooked in this soup recipe, it gives us a beautifully subtle celery-like flavour, and when blended, the celeriac helps to create an incredibly rich and creamy texture, so you'd never guess it's actually very low in calories, with only 89 calories per portion (before the bread!) 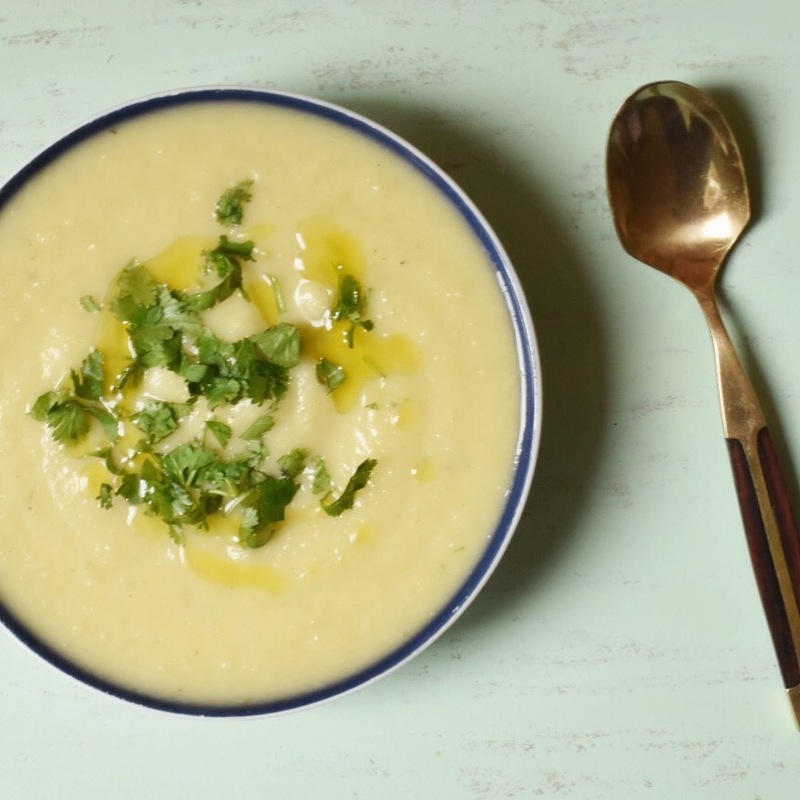 It's a proper comfort-food style soup that'll cheer anyone up on a rainy day - we seem to be getting lots of those at the moment so this creamy celeriac soup should definitely come in handy. If you like this celeriac soup then you’ll love this vegan celeriac risotto recipe - it’s easy to make but makes a really impressive dinner! In a large pan, heat the rapeseed oil on a medium heat and add the onion, leek, potato, celeriac, and garlic, and fry gently for around 10 minutes until the vegetables start to soften. Add the vegetable stock, bring the soup up to a boil, and simmer for a further 20 minutes until the celeriac and potatoes are tender. Use a stick blender or tip the soup into a blender in batches and blitz until smooth. Add the salt and pepper to taste before serving up. Then garnish with some fresh parsley leaves and a little drizzle of olive oil. Goes brilliantly mopped up with fresh crusty bread... heaven!